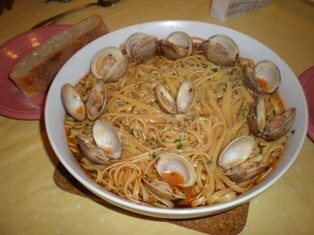 Spaghetti allo Scoglio is a standard dish in most seaside restaurants and trottorias throughout Italy. What makes it "allo scoglio" is the fact that the sauce contains a mixture of shellfish that live on or near the rocky coastal bluffs, called the scoglio. 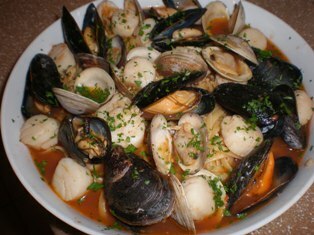 The shellfish must be very clean before adding them to sauce or it will be gritty. If possible, use a sun-dried tomato paste to duplicate the intense, rich tomato flavor of the traditional recipe. Just a small amount of the tomato paste is used so as not to interfere with the flavors of the shellfish. 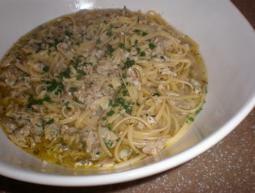 While you are preparing the sauce, cook the spaghetti until al dente. Scrub the clams and mussels well and rinse the scallops. Heat the olive oil, garlic, and red pepper in a large deep skillet over medium heat. Saute the garlic until lightly golden brown, about 1 minute. Add salt and pepper to taste. Add the wine and allow to simmer for 1 minute. Add the clam broth and bring to a boil. Stir in the tomato paste until well blended. Reduce the heat to a simmer and add all of the shellfish. Cover and cook until the clams and mussels open and the scallops are tender. This only takes a few minutes. Remove the pan from the heat. Drain the spaghetti and transfer it to the skillet with the sauce; gently toss. 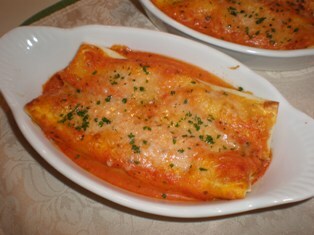 Transfer pasta and sauce to a serving platter and sprinkle with parsley.